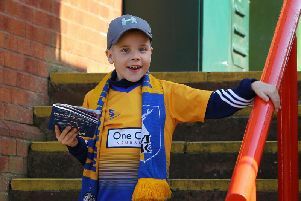 Mansfield Town put in a five star showing as they tore Newport Count apart at the One Call Stadium on Tuesday night. Goals from Danny Rose, Alex MacDonald and an Alfie Potter hat-trick saw the Stags run out 5-0 winners over an out-of-sorts Exiles. Click on the slideshow above to see the best of the action captured by Anne Shelley.